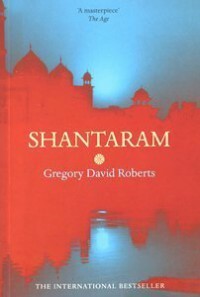 Lin, later named "Shantaram" (man of peace), is an escaped Australian convict whose exile finds him in Bombay, India. Certain events and descriptions seem to mirror Roberts' own life, but how much of the book is heavily based on fact and how much is fiction is unknown. Not that it matters. Lin's story - his experiences, his relationships, his emotions and his views feel real enough for me. My brother-in-law listened to this book twice and could not stop singing its praises. "It's one of those books that have kinda changed me," he says. "I love his perspective. He's not just perceptive, he has a really wonderful spin on the way he looks at things. Really refreshing. And I want to be able to see things in a similar perspective." My BIL tracked my progress while I was listening to it, concerned that I wouldn't enjoy it as he did, but he needed have worried. This is a love story. Not one about two people falling in love with each other - not that there isn't a romance involved (and, though really annoying at times, the romance at least ended up in a place that I was pleased with). This is a story about love and all its manifestations. It becomes clear early on, how much the author is in love with India, and he wants desperately to share that love with the reader. For me, he succeeded. Almost immediately, I fell in love with Roberts' descriptive prose (though he does sometimes go overboard, particularly when Lin is in an emotional situation). I fell in love with Humphrey Bower's powerful narration. And I fell in love with India and its people. The painting of the people and the city – even the slums, is absolutely beautiful. Roberts finds beauty in the things the average person might overlook, or even scoff at. Lulled into this comfort and beauty, I was just as shocked as Lin, the main character, when the brutality of the culture is suddenly revealed in reaction to the violent disruption of the city’s daily functions. Lin could only use the word “magic” to explain how even the lowest, most illiterate of people could so conduct business to perfection to keep business flowing smoothly. And when that "balance of necessity" is disrupted, the reaction is violent and even deadly. Even that violent reaction is an example of the culture’s efficient functioning and sense of community. And their capacity for forgiveness when it is deserved is remarkable. This is one of many lessons Lin learns and on of many quotes that I have committed to my collection (the rest are below). There were so many thought-provoking little nuggets, as well as much greater philosophical concepts for me to appreciate. If I had a hard copy of this book (which will happen soon), assume that it would be full of dog-ears and highlights on every other page! This book is also about honour, courage, fate and forgiveness. From each person and experience, Lin learns more and moves further away from the darkness he suffered when he was being tortured in prison. Lin meets many people in the span of this book and each one, even the ones who earn his ire, can be considered his teachers and they all earn a special place in his heart - and in mine. Many of the characters are not native Indians - exiles in their own way - but they too have come to love India and express that in so many ways. Robert's also, through these characters, Again, if these people are just Roberts' fictional characters, they are the most realistic people I have ever had the pleasure of meeting. On top of his incredible descriptive skills that encompass both appearance and demeanor, Roberts also gives us the heart and soul of each character such that when they are not 'on screen,' I miss them and when they return, I want to greet them as fondly as Lin does. And when they are lost, I feel the pain of it. I loved how much attention was given to the intellectual gangster, Khader Khan, who becomes a father figure to Lin. Khader frequently shares his wisdom, which he in turn learns from and shares with others. How often do you read mob stories featuring regular sit down sessions to discuss philosophy and science? Khader is, in spite of his role as mob boss, a man of honour. He refuses to deal in human trafficking or drugs and takes good care of the people in the slums that he governs. In one of my favourite scenes, two youths - best friends - got into a fight about religion. Part of their punishment as handed down by Khader Khan and decided by the people and the religious leaders of the slums, was to learn a prayer from the religion of the other. "Justice is both fair and forgiving. It is not only about punishing those who do wrong, but about trying to save them." And I can't forget to speak about Prabaker, whom I first met as Lin's guide in Bombay, and quickly fell in love with his infectious smile. I have to sing the praises of Humphrey Bower, the narrator. This book is amazing on its own merits, but it felt like Bower literally brought every one of these characters to life. Slipping from Lin's native Australian to a myriad of different Indian accents, European, Palestinian, Afghani and more - it was dizzying to imagine how Bower could possibly keep track! Yet he did, making each character unique. This book is not without its flaws and perhaps, had I been reading a physical copy, I might have determined that it went on a lot longer than it should have. There were events, such as the trek into the Afghani/Russian war, that extended the story considerably, but considering how those events affected Lin and what I learned from it, I think they are important.